WYMAN, Louis Crosby, a Representative and a Senator from New Hampshire; born in Manchester, Hillsborough County, N.H., March 16, 1917; graduated from the University of New Hampshire at Durham in 1938 and from the Harvard University Law School in 1941; admitted to the bar of Massachusetts and New Hampshire in 1941, and of Florida in 1957, and commenced the practice of law in Boston, Mass. 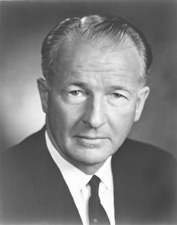 ; during the Second World War served in the Alaskan Theater as lieutenant in the United States Naval Reserve 1942-1946; general counsel to a United States Senate committee in 1946; secretary to Senator Styles Bridges in 1947; counsel, Joint Congressional Committee on Foreign Economic Cooperation 1948-1949; attorney general of New Hampshire 1953-1961; president, National Association of Attorneys General 1957; legislative counsel to Governor of New Hampshire 1961; member and chairman of several State legal and judicial commissions; elected as a Republican to the Eighty-eighth Congress (January 3, 1963-January 3, 1965); unsuccessful candidate for reelection in 1964 to the Eighty-ninth Congress; elected to the Ninetieth Congress; reelected to the three succeeding Congresses and served from January 3, 1967, until his resignation December 31, 1974; was not a candidate for reelection, but was a candidate in 1974 to the United States Senate for the six-year term commencing January 3, 1975; certified elected by the State of New Hampshire by a two vote margin; subsequently appointed December 31, 1974, to fill the vacancy caused by the resignation of Norris Cotton, for the term ending January 3, 1975, and served from December 31, 1974, to January 3, 1975; due to the contested election of November 5, 1974, the United States Senate declared the seat, for the six-year term commencing January 3, 1975, vacant as of August 8, 1975; unsuccessful in a special September election to fill the vacancy; associate justice, New Hampshire Superior Court 1978-1987; was a resident of Manchester, N.H. and West Palm Beach, Florida, until his death due to cancer on May 5, 2002; remains were cremated and ashes scattered at sea. Kutner, Luis. Due Process in the Contested New Hampshire Senate Election: Fact, Fiction, or Farce. New England Law Review 11 (Fall 1975): 25-54; Tibbetts, Donn. The Closest United States Senate Race in History. Manchester, N.H.: J.W. Cummings Enterprises, 1976.